This article was inspired by Kimberly, who is the wife of our resident SnakeBuddy, Gavin. When Gavin and I are out looking for critters, knee-deep in Cheat Grass, Sagebrush and desert sand, the title above is the text message Kimberly likes to leave for her beloved, herp-frenzied husband. What makes Kimberly’s affectionate (if slightly cynical) question so chuckle-worthy to us, is that she is openly mocking us, and attempting to get a rise out of a couple of nit-picky nature-geeks. Luckily, the myth of snakes being able to sting has pretty much died out over the years, at least in the U.S. However, throughout the course of our lives, we have probably heard the term “poisonous snake” more times than we can count. That term is said on the news, used in books, spoken in classrooms, and is often even mentioned on popular and trusted television networks like Animal Planet, National Geographic and Discovery Channel. Despite the incessant use of this phrase, it is enough to make some herpetologists and snake enthusiasts cringe. You see, what many people do not know or understand, is that (with the exception of one noteworthy example, which we will address later) snakes are NOT poisonous. However, some of them ARE venomous. 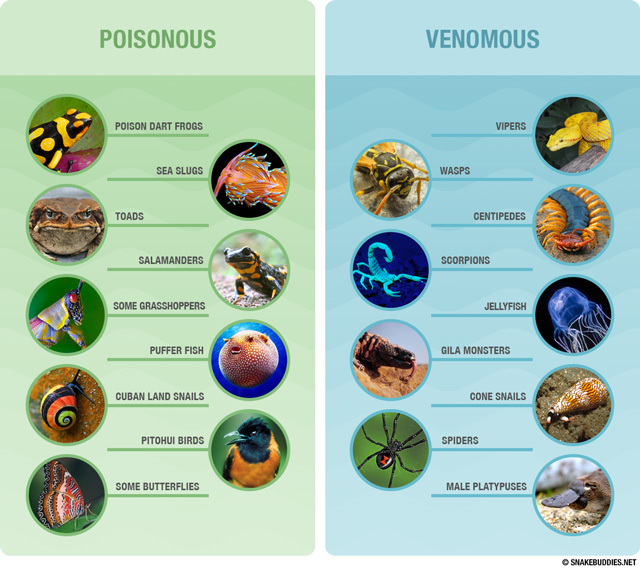 Venom and Poison – What’s the Difference? If you bite something and you die, it is poisonous. If something bites you and you die, it is venomous. This example is drastically oversimplified, and a bit extreme, but it does seem to help people comprehend the difference. Given this information, let’s consider a possible situation. We all know that rattlesnakes can potentially kill us if they bite us, right? Well, what would happen if we were to bite a rattlesnake? 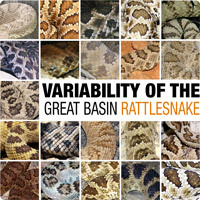 There is a long-standing, annual rattlesnake round-up in Sweetwater, Texas, where thousands of rattlers are captured, slaughtered, skinned, and consumed each year by participants and attendees. 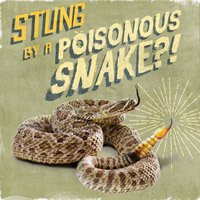 Despite so many people eating rattlesnakes during the festival, not a single person has ever died as a result. Some people have even been known to drink snake venom with no ill effect to speak of, though we remind you that this practice is potentially dangerous and highly discouraged. Imagine if the Sweetwater folks decided to hold a Poison Dart Frog round-up, and participate in all the same activities that they do with the rattlesnakes. You can rest assured that most folks would not be alive for the next year’s event. Venomous vs. Poisonous animals – Which is Which? Below, is a small spreadsheet for you to review, in the event that you are still unsure which animals qualify as venomous, and which are poisonous. Some of the culprits in each category are pretty obvious, while others may be a bit surprising. Did you know, for example, that there was a poisonous species of bird, or that the cute little Platypus (males only) possess an extremely painful venom, delivered by a sharp spur on their back legs? You also may notice that some animals on the poisonous side may have a seemingly similar relative on the venomous side. Some land dwelling snails for example, are quite poisonous and should be left off of the Escargot menu, while the ocean-dwelling Cone Snail comes equipped with a harpoon-like projectile, that it shoots into small fish, injecting them with a paralyzing venom. Cone Snail venom is extremely dangerous to humans, in addition to the fish the snails hunt. Avid seashell collectors could be in for a nasty surprise, if they pick up the attractive shell of a Textile Cone Snail. Though Puffer Fish and Jelly Fish are not closely related at all, their common names might suggest that they are, but their means of hunting, and defense from predators are as different as their looks. The Puffer Fish is host to one of the most lethally toxic poisons (tetrodotoxin) known to man, yet it is surprisingly still considered a delicacy to adventurous Japanese diners. When this cuisine called Fugu is correctly prepared, those consuming it may experience tingling and numbness in their lips and mouth. When prepared incorrectly, those consuming the fish may experience death. Jelly Fish, on the other hand, are not poisonous at all, but certain types of them have millions of venomous stinging cells that are shot into their victims, upon direct contact with their long trailing tentacles. The Box Jellyfish is said to be one of the world’s most lethally venomous creatures, and those unlucky enough to brush up against one, experience excruciating pain and paralysis. This brings us to the “noteworthy exceptions” mentioned above regarding snakes. Leave it to Mother Nature to keep us on our toes. Perhaps most notable in these exceptions are snakes in the genus Rhabdophis. 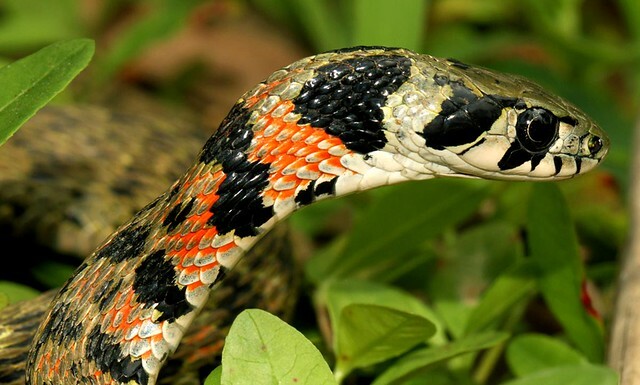 Within this genus, the Tiger Keelback of Eastern Asia has been known as a rear-fanged colubrid with a venomous bite for some time. However, in recent years, scientists have discovered that it is not only venomous but that it also has glands located behind its head, that can secrete a poison, making this snake both venomous and poisonous! Interestingly, this snake does not produce its own poison but sequesters it from the toads it eats, and stores the toxic fluid in the glands behind its head. When threatened by a predator, the Tiger Keelback will rear up and keep the back of its neck closest to its attacker. If the predator bites the snake, it will get a mouthful of bad-tasting, and eye-irritating toad toxin. Despite our best efforts, we still fully expect to hear people (including Gavin’s wife and the Discovery Channel) use the term, “poisonous snakes”. That’s quite alright as far as we’re concerned, as it will always allow us the opportunity to educate others about the animals we find fascinating. We do however hope that you readers might now appreciate the subtle nuances between venom and poison, and use this knowledge to wildly impress all of your friends and peers… or at least your mom. Thanks for Being a SnakeBuddy! If you liked this article, feel free to share it with your pals via the Facebook and Twitter buttons below. We appreciate your help in spreading the word, and invite you to let us know what you think of the article, and if you have any suggestions for future articles as well. In addition to subscribing to our blog via the link at the top of the page, you can also follow us on Twitter @snakebuddies and like us on Facebook at “Snake Buddies“. Thanks a bunch, and remember to keep an eye out for our legless friends. This entry was posted in centipede, Poisonous, rattlesnake, Snakes, venomous and tagged Cone Snail, fangs, poison, poisonous snake, poisonous snakes, snake venom, stings, Tiger Keelback, Venom, Venomous snake, venomous snakes. Bookmark the permalink. Love this post! Thanks for pointing out the differences in such a clear, easy-to-understand way. I often try to point this out to people…now I can just refer them to your post. And I learned some new things, myself. Never heard of the tiger keelback, for instance, though I’m far from an expert on snakes. I’m only familiar with the four venomous ones we have in central Florida, really. (And the copperheads from northern Florida, too). 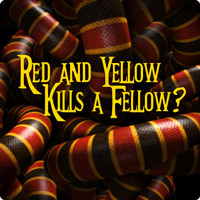 I really like your “If you bite something and you die” example, too, and am going to remember that when I tell people why (most) snakes aren’t poisonous at all. Thanks again! Marcia, you are so kind! We are happy that you enjoyed it, and can use it as a resource. That is one of the big reasons we write articles like these. After the 100 time trying to explain it, I think, “Gee, if only I could send them a link”. LOL Now we’ve got one! 🙂 Thanks again for your kind words, and don’t hesitate to reach out, if you have any questions we can help you answer. You should turn this into a poster! I’d sure buy one! Thanks so much for the postive feedback, Val! Are you referring to the list of venomous and poisonous animals graphic, or one of the others? Thanks for visiting our blog! Thanks Elizabeth! We appreciate your comments. And yes, admittedly, we should have addressed the “sting” thing. I think an edit is called for, and will add it in. Thanks for mentioning that! Thanks Grant! Glad you liked it. We hope to publish another good article later this week. Stay tuned. Great article, really informative, and a great set of images used to illustrate your point.